OAK RIDGE, Tenn., April 22, 2016 - Neutron scattering and computational modeling have revealed unique and unexpected behavior of water molecules under extreme confinement that is unmatched by any known gas, liquid or solid states. 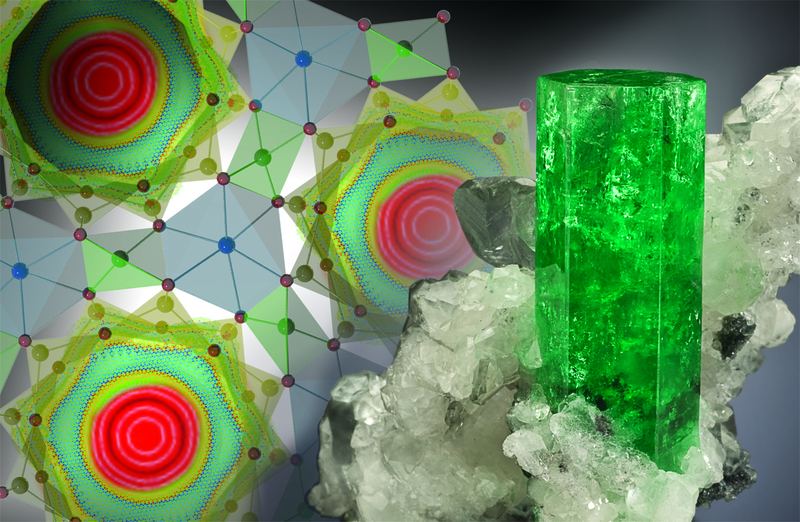 In a paper published in Physical Review Letters, researchers at the Department of Energy's Oak Ridge National Laboratory describe a new tunneling state of water molecules confined in hexagonal ultra-small channels - 5 angstrom across - of the mineral beryl. An angstrom is 1/10-billionth of a meter, and individual atoms are typically about 1 angstrom in diameter. The discovery, made possible with experiments at ORNL's Spallation Neutron Source and the Rutherford Appleton Laboratory in the United Kingdom, demonstrates features of water under ultra confinement in rocks, soil and cell walls, which scientists predict will be of interest across many disciplines. "At low temperatures, this tunneling water exhibits quantum motion through the separating potential walls, which is forbidden in the classical world," said lead author Alexander Kolesnikov of ORNL's Chemical and Engineering Materials Division. "This means that the oxygen and hydrogen atoms of the water molecule are 'delocalized' and therefore simultaneously present in all six symmetrically equivalent positions in the channel at the same time. It's one of those phenomena that only occur in quantum mechanics and has no parallel in our everyday experience." The existence of the tunneling state of water shown in ORNL's study should help scientists better describe the thermodynamic properties and behavior of water in highly confined environments such as water diffusion and transport in the channels of cell membranes, in carbon nanotubes and along grain boundaries and at mineral interfaces in a host of geological environments. "This discovery represents a new fundamental understanding of the behavior of water and the way water utilizes energy," Anovitz said. "It's also interesting to think that those water molecules in your aquamarine or emerald ring - blue and green varieties of beryl - are undergoing the same quantum tunneling we've seen in our experiments." "The average kinetic energy of the water protons directly obtained from the neutron experiment is a measure of their motion at almost absolute zero temperature and is about 30 percent less than it is in bulk liquid or solid water," Kolesnikov said. "This is in complete disagreement with accepted models based on the energies of its vibrational modes."